I always knew I would be the poster child for Postpartum depression. I struggled with depression since my freshman year in college (although I didn’t know what it was back then; I called it homesickness) and had a major relapse in 2003 after a breakup of a significant live-in relationship. It was then I was diagnosed with bipolar disorder II. Bipolar disorder II is different from Bipolar I because I would have hypomanic stage, I wasn’t flat out blabbering, streaking the town naked crazy; but I would get very creative and felt as if I was on top of the world. A state that I quite liked, but I disliked the depressive state; so hence the medication. After couple months of being on mood stabilizer and anti-depressants, I decided that life through chemistry was not me. I joined a yoga class and that was very anti-meds. However, after the birth of our daughter, Layla. My mental state quickly became a concern for the entire family. Whereas before, I loved blurring the line of insanity; it was not appropriate for a mother of a newborn. I was quickly developing overly anxious attitude towards my daughter. I felt angry and cheated. I resented my baby. I loved her but hearing her cry one more second would make me want to throw her across the room. Scared by these incredibly powerful emotions; I sought help. Since I wanted to continue breastfeeding, medication was put off the side in lieu of talk therapy. Talking to my therapist helped but there was still that underlying anger and frustration. Then the significant other got a job in West Palm and we drove over 1500 miles to start a new life. The move had me go into a total mental breakdown. I did not trust myself around my daughter. I was ready to have myself committed. The only reason I didn’t commit myself was because I wanted to continue breastfeeding. It was the only thing, I felt, that I could offer to my daughter. Instead of committing myself, We decided to seek help out of pocket. I found a psychologist and was referred to a psychiatrist. Both recommended that I go on medication… pronto. Although it really went against everything I believed in; for the sake of my daughter, I agreed. I was put on Symbyax which is Prozac combined with anti-psychotic, Olanzapine. This stuff wasn’t for the meek. It was for the flat out crazies, and Sadly, I am one of them. The psychiatrist and the psychologist both strongly suggested that I wean my daughter, but at four months of nursing; I was not ready to do so. I don’t think my daughter was ready to be weaned either. We played around with the idea of supplementing with formula, but I just couldn’t do it. The effects of an untreated depressed mom on the infant are significant and hazardous; but the marginal effects of any medication usually are less hazardous than those effects. Treating a mom with postpartum depression (PPD) is much preferable to not treating, since a baby has a better outcome generally (as measured by Bayley scores, measuring interaction skills and speech and language development) when being cared for by a non-depressed parent. PPD is significantly more dangerous compared to depression outside of postpartum; PPD patients are sometimes more likely to commit suicide, and need to be treated with due haste. Waiting to wean before starting medication is not a sound option. Also, weaning in order to treat is not a good choice due to the loss of the positive effects of breastfeeding. The rate of depression in the general population in an individual’s lifetime is between 3% and 17%. However, in the postpartum population depression is about 15%, and is often more severe. For example, it moves to psychosis more frequently. In all studies thus far, any negative effects of medication usually occur in the first 30-60 days postpartum, so breastfeeding beyond that and taking medication is usually fine. Babies exposed in utero can suffer “discontinuation syndrome” (a.k.a. withdrawal effects) but sometimes this is misdiagnosed as a reaction to the continued medications in mom’s milk, when really the milk transfer rate for many of the SSRIs is negligible. In a study that was published in the American Journal of Psychiatry, Olanzapine is relatively safe during breastfeeding. In seven mother-infant nursing pairs, high-performance liquid chromatography revealed that the median infant dose of olanzapine ingested through milk was 1.02% of the maternal dose. Maximum relative infant dose was approximately 1.2%. The authors point out that these ratios are much lower than the national cutoff of 10.0% used to guide drug safety during breast-feeding. In six patients with data collected over the dose interval, the median milk-to-plasma area-under-the-curve ratio was 0.38. Six infants with an evaluable plasma sample had undetectable levels of olanzapine. All of the infants were healthy and had no apparent adverse events. Yoshida et al. studied four mothers who took fluoxetine and their breast-fed infants. Fluoxetine and norfluoxetine were detected in all samples of maternal plasma (range of total concentration 138-427 ng/ml) and in breast-milk (range 39-177 ng/ml). Amounts of both fluoxetine and norfluoxetine in infants’ plasma and urine were below the lower limit of detection. All infants were observed to be developing normally and showed no abnormal findings on neurological examination. Although both studies had a very small sampling group; it was reassuring enough for me to continue nursing my daughter. I am happy to report that thus far, she has not shown any adverse effects of the medication. Better yet, she has a mother who wants to be with her. Who wants to hold her, and who is being a much much better parent than when she was not on medication. I am thankful that I got the help that I needed in time. I am not sure where I or my daughter would be if I hadn’t got the help I desperately needed. I am not advocating happy pill popping, but there are times that Western medicine trumps the holistic and natural therapy. I am telling this story in hopes that another mother who is going through what I went through will find inspiration to get the help that she needs. Postpartum depression is no joke. Tom Cruise aside, it happens a lot more than one would think. I hope that sharing my story will encourage any mothers to continue breastfeeding even if she’s on anti-depressants. Author’s Note: This is my own personal story with supported research on why I decided to continue breastfeeding while on anti-depressants. Please do not take this as a medical advice, as I am not a doctor. Please consult with your own if you decide to continue breastfeeding while on anti-depressants or decide to go on anti-depressants. I agree with your assessment that the benefits of breastfeeding outweigh any possible effects of antidepressant meds, and believe that Doctors are FAR too picky about nursing moms and meds – probably out of ignorance more than anything. I interviewed Kathleen Kendall-Tackett on my podcast recently on the topic of breastfeeding and depression, perhaps your readers would be interested in reading the transcript (link in the profile). Thanks for your brave story and really helpful information. I agree and wish society understood how postpartum depression isn’t something that’s in “your head” and that “pulling yourself up by the bootstraps” isn’t going to do it. Like other types of depression, postpartum depression is real and deserves the attention and support as other physical ailments. This is more than just feeling a little sad or tired. This can be very serious and deserves not to be ignored. Despite people like you who bravely share your story, I have friends who hear from their chat room friends that women STILL prefer to suffer in silence and are too ashamed to reach out for help, even though getting support would help. They are home alone, isolated and depressed. Postpartum depression is treatable, but only if these women reach out for support. One place that may help is going to the Internet for support from professionals who can help you decide if medication is the right option. One website http://www.MyTherapyNet.com seems to be very popular for new moms who have postpartum depression or even the “baby blues”. I have one friend’s daughter that sees a therapist in a virtual office here and says she’s getting support. She was ashamed of her thoughts and feelings and too tired and overwhelmed to even leave home. It seems getting support over their computer may be the answer…she’s feeling better. I invite you and your readers to join The Buoy for Perinatal Blues Online Community! Women & families need a buoy to hold onto during the difficult journey until they can see the beacon of light that will indeed shine. Susie, I think you are amazing for sharing your story and are a great momma to Layla! Thank you for sharing your story and including the links and sources. 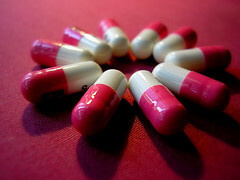 I have known for years that I probably needed medication, however it is hard to accept. It’s always seemed like a cop out. But after the birth of my second daughter, who happens to be the easiest baby on earth, and I still get manically depressed, I realize now that I need help. As you had hoped, this will help me seek that help that we all need. Thank you for your article. My daughter is almost 10 months and I am still breastfeeding. I started taking Zoloft when she was around 6-7 months old for symptoms of low mood, stress, anxiety and having a “short fuse” towards my husband mainly. I would easily get very upset and angry, something I blamed on marital problems. I was also struggling with isolation, being a stay at home mom and not having any close friends. She has not had any problems since I started the Zoloft. I’m considering adding Wellbutrin, because I’m still having some symptoms of depression. Thanks again for sharing your story. I could have written this, from the 4 month old to the 1600 mile move to the talk therapy! In fact, I found this article while in line to pick up my Symbyax! So happy to read this and hear a success story. This is not a position I was expecting to be in and I’m so glad there are others who have been through this. There is hope! !